Massive cruise ship hull art provides character and recognizability when pulling into port. A simple whitewashed hull has long been a classic choice for cruise ship exteriors, but more and more cruise lines are employing bold designs to don their ships’ bows. So when a ship pulls into port these days, chances are you may recognize it from quite a distance, thanks to massive and vibrant hull designs. These appliqués are not only attention grabbing, they are themselves beautiful works of art. Disney Cruise Line refers to its bow tips as “filigrees taking inspiration from the figureheads of historic sailing ships and rendering sinuous art nouveau waves off of a medallion” — with none other than Mickey Mouse featured in the center. Upon closer inspection, you’ll find other Disney characters incorporated as some ride personal watercraft over the crests. Also interesting is how Disney Dream and Disney Fantasy specifically include four stars in their designs to represent the current count of ships in the fleet. Further differentiating the existing vessels is the nature of Mickey at the bow of each. “Sorcerer Mickey” is seen on Disney Magic, “Helmsman Mickey” on Disney Wonder, “Captain Mickey” on Disney Dream, and “Sorcerer Mickey” on Disney Fantasy. Particularly playful, though, are Disney ships’ aft sections where Disney characters are sculpted three-dimensionally in service of painting the name on the stern. Goofy is on Disney Magic; Donald Duck and his nephews Huey, Dewey, and Louie (only the eyes of the last two are seen) are on Disney Wonder; Sorcerer Mickey and the Magic Brooms are on Disney Dream; and Dumbo and Timothy Q. Mouse are on Disney Fantasy. After all, “What’s more fantasy than a flying elephant?” asked Bob Zalk of Walt Disney Imagineering (the company’s design team), especially one with an impressive “ear-span” of seven feet. 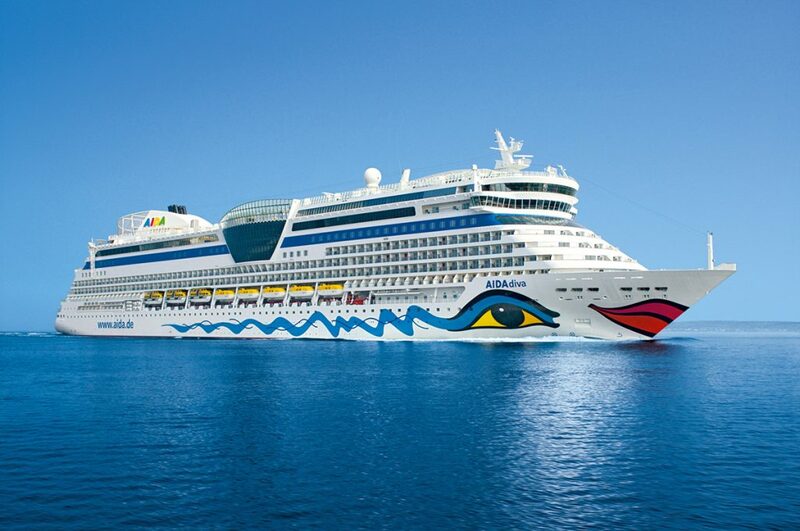 German cruise line AIDA Cruises uses geometric lips and eyes on its hulls that equally take cues from the art world. German artist Feliks Büttner drew from the princess of Giuseppe Verdi’s namesake opera when approaching a blend of Egyptian-inspired motifs and modern art for the line’s first ship, AIDAcara. Of course, the main goal then was to be striking and garner interest in cruise travel — an objective that continues to this day — with the welcome smile since applied to the brand’s latest AIDAperla. Generally, AIDA’s ship lips measure around 16 meters (52 feet) overall while the eyes encompass some 150 square meters (492 feet) with about 140 meters (459 feet) of eyeliner at its longest. More than 400 liters (105 gallons) of paint were remarkably required for AIDAdiva’s lipstick, for instance. Other international cruise companies that feature hull artwork include P&O Cruises UK, whose ships boast the….